April 24, 2018 By Liz 59 Comments Note: This post may contain affiliate links. Ok ok, let’s clear the air. This isn’t one of those you’d-never-guess-it-wasn’t-real-bacon kind of recipes. It’s not exactly the same. But this vegan tempeh bacon is smoky, crispy, and full of umami flavor. 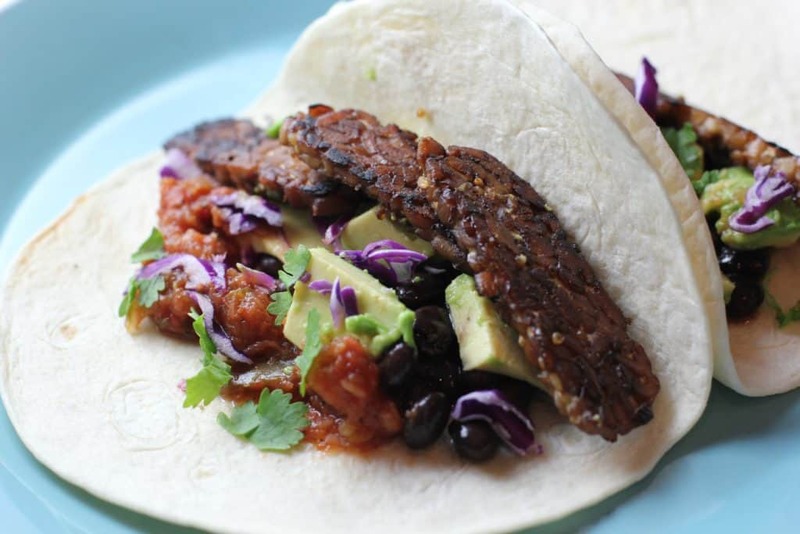 Tempeh is loaded with protein and it’s delicious wrapped up in a taco. It’s perfect piled onto a sandwich or crumbled into a salad. You could add lettuce and tomato and make a sandwich, or you could mix it into a stir fry. Basically, this tempeh bacon can do just about anything. If you haven’t tried tempeh before, it’s a soy based food made from fermented soybeans, similar to tofu. It’s usually sold in the refrigerated part of the natural foods section, near the tofu. It doesn’t have a strong taste on its own, but it’s fabulous at absorbing flavors. 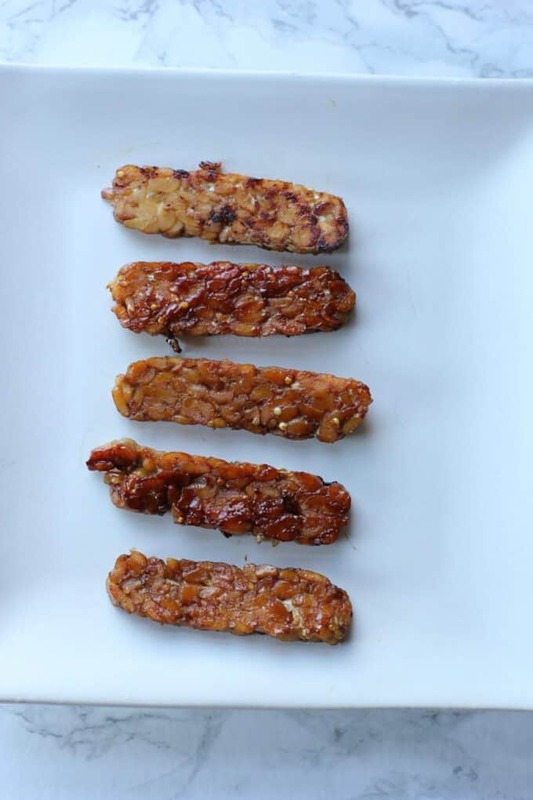 With a little marinating, we can transform tempeh into a deliciously umami-packed protein. Does tempeh taste like tofu? I personally think the texture of tempeh is much better than tofu and it’s easier to work with because there is no draining or pressing required. If you’re looking for a good source of plant-based protein, but you’re not a fan of tofu, give tempeh a chance. In fact, 3oz of tempeh contains 16g of protein and just 140 calories. The trick to delicious tempeh? Marinate it! Tempeh absorbs flavors really well, but it can take some time. Let it marinate overnight, if possible. If you don’t have time to let it marinate, you can steam it first, to help open up the tempeh to absorb the flavors better. Sure, it’s not bacon, but it’s crispy, smokey, and delicious! Slice tempeh into thin strips. You want to slice them as thinly as possible. If you have a steamer basket, steam the tempeh for 10 minutes over a pot of boiling water. This will cut its bitter edge and will make it more tender and absorbent. The tempeh will get lighter and will expand slightly. If you don’t have a steamer basket, you can skip this step! In a shallow dish, whisk together all the ingredients. 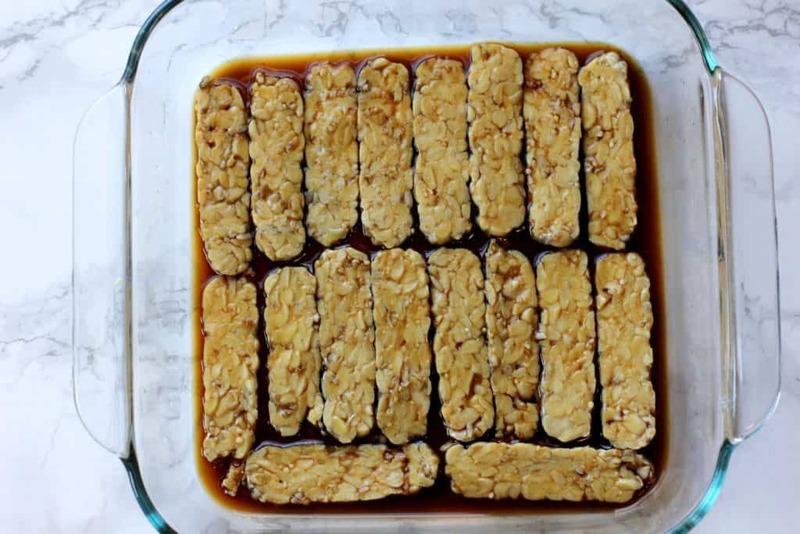 Place the tempeh (in a single layer, or double layer, if possible) and gently tilt the dish until all the tempeh has been covered with the marinade. Marinade for at least an hour, or overnight. Heat the oil in a pan over medium heat and spread the tempeh in a single layer. Cook for 5-7 minutes over medium heat and let it brown before flipping to the other side. Cook on the other side for another 3-5 minutes until brown on both sides. It should get nice and crispy. Liquid smoke might sound weird, but it’s made from a concentration of smoke from wood. Chips or sawdust from hardwoods like hickory are burned at a really high heat, and particles of the smoke are collected in condensers. That’s how they make liquid smoke! It really gives this tempeh the perfect flavor. This vegan tempeh bacon is so good. Sure, it’s not the real thing, but it’s delicious. Try it in these vegan tempeh tacos or add it to this broccoli fried rice. You can make the tempeh ahead of time and heat it up when you’re ready to enjoy it, although it won’t be quite as crispy as when it’s freshly made. 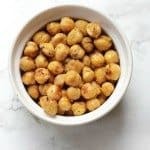 It can be a great vegan protein to make during your weekly meal prep! 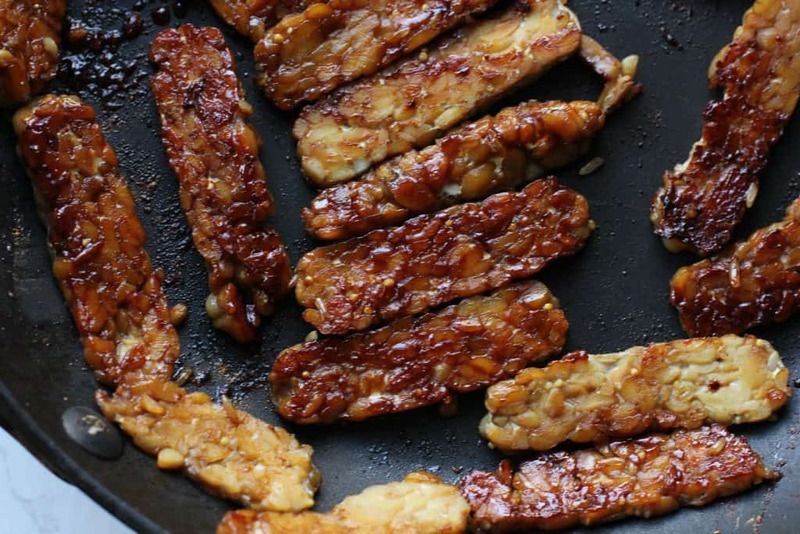 Have you ever tried to make vegan tempeh bacon? This post was originally published in January 2015. Updated April 2018. Back in my vegetarian days, I used to eat Morningstar’s “bacon.” It was ok in my book, but nothing ever comes close to the glory of real bacon. I actually like turkey bacon better than regular bacon which is probably blasphemy on some level. Ha! I do love Morning Star’s veggie burgers, so I’d be willing to give their fake bacon a try! I haven’t tried fake bacon, but enjoyed fake sausages from Whole Foods. I purchased them a few times and I loved them. They were mostly made from potatoes, which I love. 🙂 So perfect for me. Those meat eaters around me couldn’t be convinced, but I thought it tasted like the real deal. 🙂 This looks interesting, I like the BLT idea. Thank you for sharing. I have never tried fake bacon and it sounds awful (ha!). I have tried vegan cheese and it was awful. Yeahhhh vegan cheese is not so good. It just doesn’t melt right! 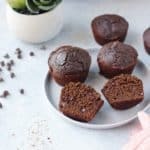 My sister is vegan, so she totally needs this recipe! I also love the smell of bacon frying. Bonus points if it’s maple bacon. I’ve never tried “fakon” but you’ve got me curious. I am not vegetarian, but I do love vegetarian (and vegan) dishes and recipes. In fact, usually my breakfast and lunch most days are vegetarian. How interesting! I’m not a huge bacon person (I know….wtf). I like it occasionally, but I personally prefer chicken sausage 😀 That cooking class sounds fun though! Taking one is definitely on my to-do list. Hah! To each their own 😉 If you’re looking for a cooking class, definitely check Groupon and Living Social! Never heard of tempeh bacon! Sounds like something I’d want to try! I haven’t tried a vegetarian bacon but this looks great! Like others I’ve tried Morning Star’s “bacon” and I actually love it. It’s really easy to microwave in the morning when I’m on the go. My mom is a vegetarian, so I’ll def share this recipe with her. Ohh I’ve never tried Morning Star’s but I believe theirs would be good. I LOVE their veggie burgers! This is the only “facon” I will happily partake in. Tempeh is a staple in my fridge, and I usually eat it plain (I know, I’m weird) but I LOVE getting it jazzed up like this when I go out. Thank you for sharing! Haha I don’t know if I could eat it plain but I love it in stir fries! And that class sounds like it was so much fun. I would love to do something like that! Tempeh bacon is SO good! I love, love, love using it for TLTs! It’s funny how many [US?] vegetarians say they missed bacon. I don’t at all and also can’t say I liked the smell of it cooking but that’s most definitely a country-specific issue. Either way, I tried the tempeh bacon from Kristy Turner’s new book when testing for her and even my non-vegetarian family enjoyed it. Probably more than me 🙂 . I absolutely adore the smell of bacon but just cannot stand the texture of it, or most meats actually. I hate that feeling of having to chew and chew and chew to get something down that I get when I’ve tried bacon in the past so I tend to stick to veggies and other sources of protein. I’m the exact same way! I never liked the texture! I’m actually not a fan of real bacon, but the texture of the non crispy parts make me queasy. I’m the same way with all meat actually. But turkey bacon? Perfection. Haha back when I ate meat, I definitely preferred turkey bacon for the same reason! 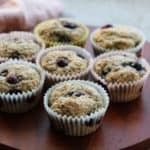 Just came across your website- and I love it! 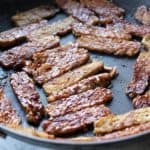 I’m a vegetarian for the most part as well (i eat fish very occasionally) and I’ve been looking for ways to cook tempeh bacon forever! So you know, it doesn’t as much like tempeh. I’ll definitely be trying this! I get a bit sad every time I see a blogger mention tempeh because I’ve never seen it in Kuwait. Guess it’s something i’ll have to try out when we visit the States in a few months! The smell of real bacon actually makes me super, super nauseous but I love facon (we call it that, too!). Tempeh bacon is a favorite of mine. I love how easy it is to pull together. My favorite is making my eggplant bacon! Gotta have my vegan blts! I must admit the smell of bacon actually makes me feel nauseous… probably because my brain associates it with smell of cooking pig flesh 🙁 , BUT I did try tempeh ‘bacon’ once at a festival. It was served in a roll, and it was SO good! I’ve only tried cooking tempeh once at home and it wasn’t very successful as it tasted really bitter. Next time I’ll have to try your tip about steaming first. Sounds like that will do the trick! Tempeh ‘bacon’ is a must for a decent vegan Full English Breakfast in my house and your recipe looks lovely, I do like the simple stuff, no faffing! I just saw a recipe for aubergine (eggplant) bacon which I reckon may be worth a try too – a whole world of smoky breakfasts is out there! I don’t eat Bacon, but I’d eat platefuls of this stuff! It sounds Delicious! How interesting! I have never heard of vegetarian bacon, and I have to say.. tempeh does not have the same mouthwatering look to it like bacon does, but I do love soybeans so I bet it would taste great. This looks like a great alternative to the real stuff! The smell of bacon is sooo delicious! I love it, but also love tempeh, so I might have to try this! We are trying to consume less meats and poultry at our home, and more fruits, veggies and grains. So I think this recipe will be a great fit for our meals! I’ve never tried this but definitely would consider it as it looks delicious – but I do love bacon a whole lot haha! I’ve seen vegan bacon made with carrots before, but never tempeh. Yours looks absolutely delicious and I bet the liquid smoke makes it taste amazing! That looks soo yummy!!! It does look like meat! YUM! Bookmarking. Your recipe seems really simple and I have all of the ingredients. Can’t wait to make it. Although I’m not vegan I’ve sampled a lot of vegan bacon. I do really like tempeh bacon warm but it’s not as great once it hits room temperature. So far my favourite has been rice paper vegan bacon that I tried in Victoria, British Columbia. I also really hate it how all of these vegan substitutes are filled with chemicals and god knows what do they add to them. 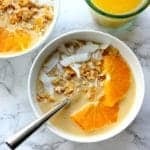 This recipe sounds like a great alternative and it looks very appetizing as well. Okay, you’ve seriously got me craving a vegan tempeh BLT right now! 😂 Love it! I keep meaning to play around with tempeh! This sounds so great. Since going pescetarian, I don’t quite miss bacon on it’s own (weird, I know), but I do miss that salty crunch in certain sandwiches. I really need to give this a whirl. It’s very hard to let bacon go once you fall in love with it 🙂 This sounds like an interesting substitution. I’ve never tried cooking with tempeh at all! I’ve had it before at restaurants but never cooked with it. This does look good and I do like bacon. I’m not sure how I feel about this one but I’m willing to try it! It sounds interesting. The liquid smoke is totally what makes it. I made a double batch, didn’t bother steaming the tempeh since i never do. I actually baked these instead so i didnt have to do batches in my skillet. 400 degrees for 10-12min, flipped and another 8 min or so. Haha yeah i hardly ever steam it first. I’m usually too lazy and i think it’s nearly as good without that step! This sounds great can’t wait to try it! 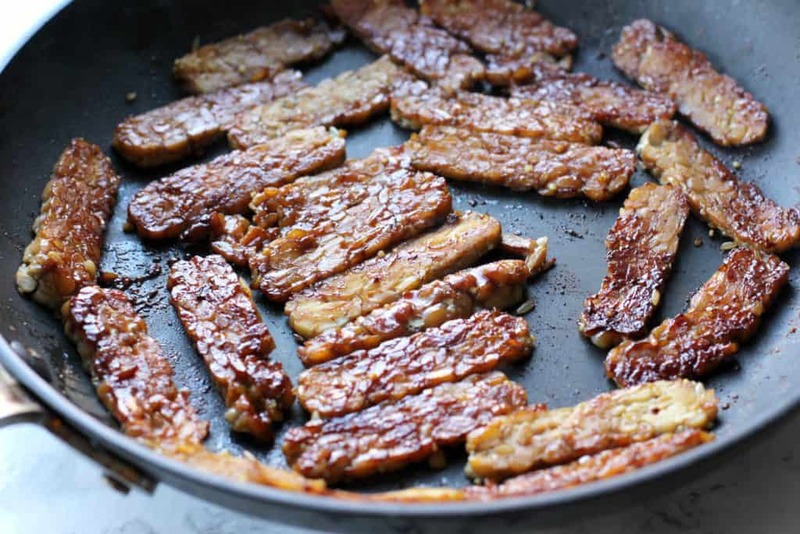 I’ve never tried tempeh before but I LOVE the idea of this for a vegan-friendly “bacon.” I bet the soy and liquid smoke add great umami flavor. Yes! It’s usually sold by the tofu in the refrigerated part of the natural section of the grocery store! Smoky, crispy and umami… say no more! 🙂 I’ve never tried tempeh bacon before, but now I’m intrigued! And I love the idea of liquid smoke and marinating it with maple syrup. Thank you so much for sharing!